Tales from the home of willow and jools: When Willow made a splash. I drove today past a spot that has a Willow related incident attached. I thought I'd record it here. About 5 years ago on a very sunny and hot Spring Bank Holiday Monday, I, my husband and my mother ( who was then a very fit 70-odd year old)decided to have a walk with Willow, along the canal to look at the new link to the River Ribble near Preston. Willow was skipping about and we were all looking at the lock when suddenly I heard the scritchy scratchy sound of dog claws trying but failing to hold on to stone and then PLOP as the dear dog landed in the water down below. We couldn't even reach her. We pulled at the gates lower down on the lock but to no avail. Then we spotted the ladder. B climbed down the ladder up to his waist into the water, and grabbed poor Willow , who is not built for flotation and had been treading water for about 5 minutes, by the collar, and attached the lead. We tried to drag her out but stopped when the strangulation sounds got dangerous. It was then that we remembered we had a phone and I rang 999 explaining that the dog was in the water. The trouble was that we didn't know exactly where we were. They asked what we could see. It was fields and electricity pylons for miles..and the new lock but that was no help. While we waited for help B held willows head out of the water while her back legs paddled furiously and she whimpered occasionally. Half an hour went by so I rang again and said my husband was in the water too so that seemed to move things along a bit. I just expected some policeman with a means of opening the gate, or a rope. We heard the sound of sirens. A crowd gathered from nowhere. A second fire engine, then a third, followed by a large truck with something like 'Incident support unit' written on the side. A huge gang of firemen jumped out, took in the scene and threw a large bag on a rope at my husband saying 'Could you put the dog in the bag sir?'. Remember, he was clinging to a ladder with one hand, and holding Willows head with the other and up to his elbows in dirty green canal water. He managed and the fireman dragged the bagfull of dog out onto the opposite side of the canal to the path. The next problem was to get a cold wet Willow to walk across the open work metal mesh bridge to our side. 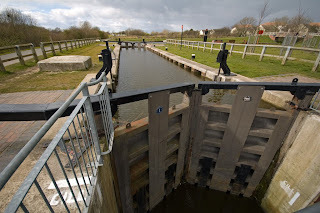 All this time a man in a British Waterways jacket was leaning on the lock gate watching. The firemen took B back to the car in a fire engine but Mum, and I had to walk with wet traumatised Willow, the hour and a half back to the car. By the time we got there B was sitting inside with his socks, trousers and boots drying on the car bonnet and an anorak over his nether regions.. The next day there was a teeny little paragraph in the local paper describing Willow as a cross breed, and saying she had to be rescued because she was tired. I think it had been a quiet bank holiday for those firemen. Jackie, I've just been catching up with your blog and am so sorry for Willow's death. This is one of those stories where you can see the funny side afterwards. I laughed and cried reading it. I hope that these precious memories will gradually fill up the emptiness. Yes,they are precious memories to keep.